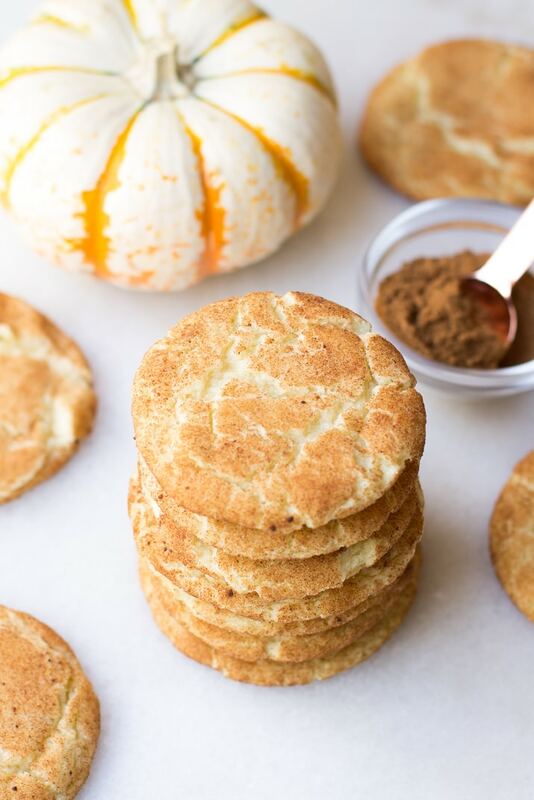 Classic snickerdoodle cookies get dressed up for fall in this Pumpkin Spice Snickerdoodles recipe. 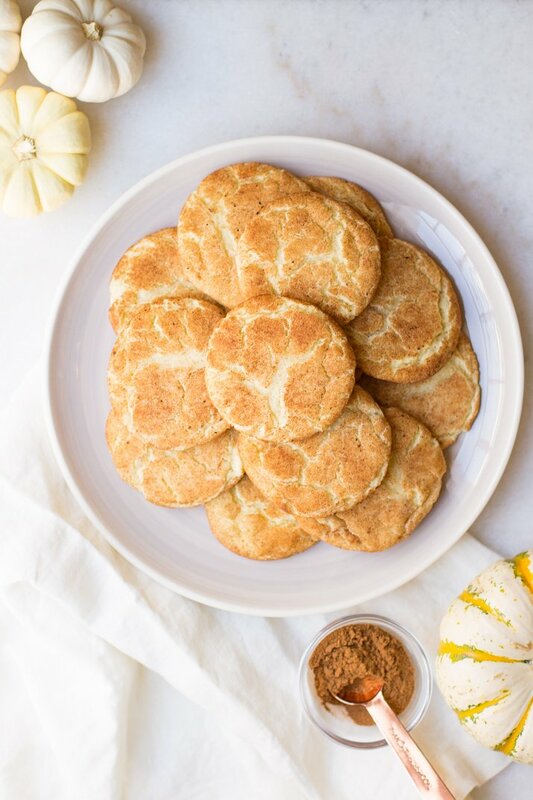 These big, soft cookies with a crisp pumpkin spice coating are sure to be a fall favorite! 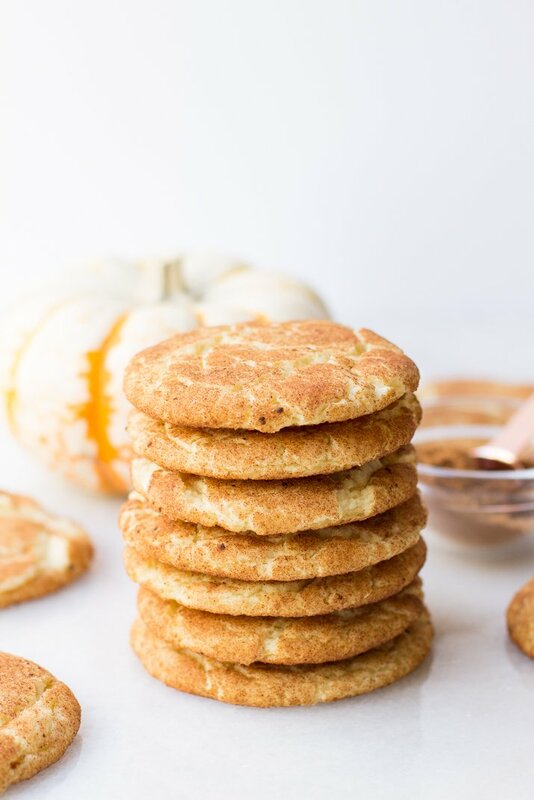 These Pumpkin Spice Snickerdoodles are a fun fall twist on the classic cookie! There is something so comforting about classic cookie recipes, isn’t there? Maybe it’s the nostalgia of childhood and coming home from school to your mother’s baking. Or perhaps it’s the familiarity of biting into a treat you already know you love. Whatever the case, you can almost never go wrong with resorting to the tried and true classics. Sometimes, though, you want a bit of something new. Something fresh and just a tad out of the ordinary. And during this season, you want something pumpkin! 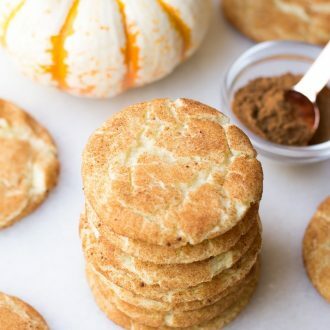 In that case, these Pumpkin Spice Snickerdoodles are the perfect fall treat for you to make this season and a great twist on an adored classic. These cookies are big and soft and something you can really sink your teeth into. They have a rich, slightly tangy and chewy sugar cookie center with a crisp and fragrant pumpkin pie spice crust. My favorite way to enjoy these treats are warm, fresh out of the oven, and dunked in a hot cup of coffee! As you make these delicious cookies for yourself, don’t forget about the cream of tartar. 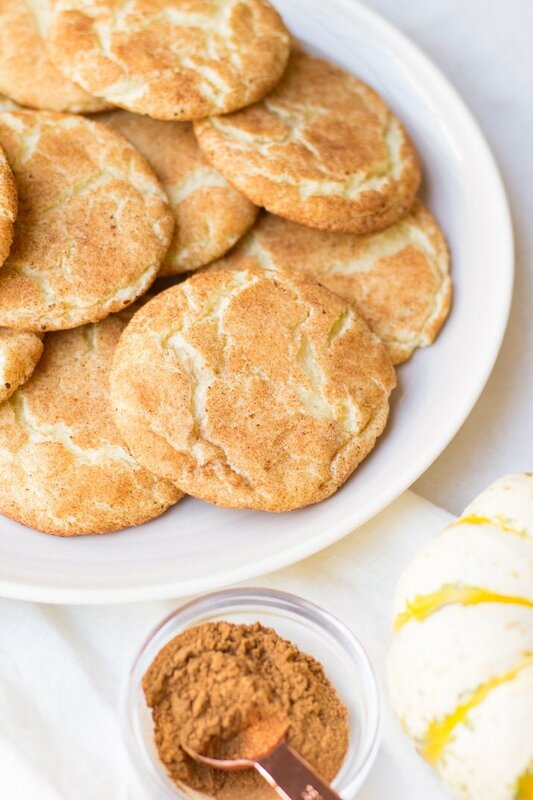 As I recently learned while developing this recipe, the cream of tartar is essential to both the snickerdoodles mild tangy flavor and it’s notable crinkled surface. 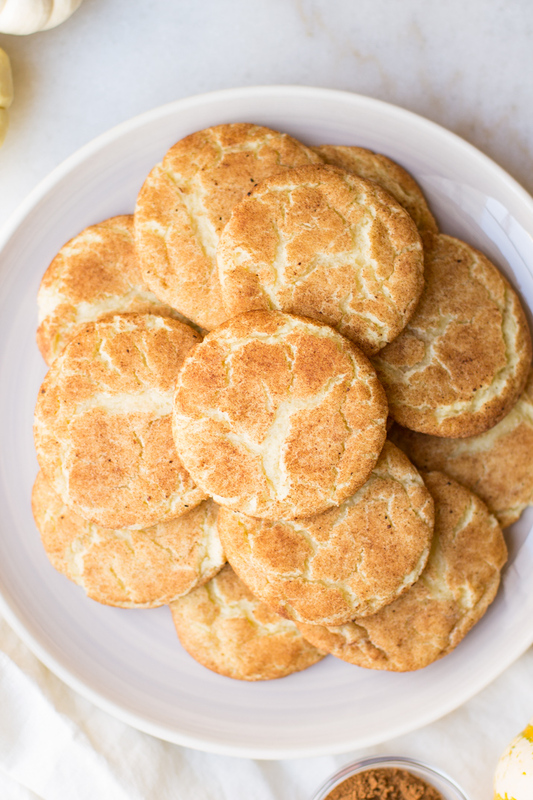 And what is a snickerdoodle cookie without the crinkles? Another baking note is to make sure your butter isn’t too warm before you begin. Your butter should be firm but pliable, like the consistency of play dough. A simple trick is to remove your butter from the fridge right before baking and put it in the microwave standing straight up. Heat for 10 seconds, then flip the stick over and heat for another 5-10 seconds until it’s as warm as you like. Place oven rack in the middle of your oven and preheat your oven to 375°F. Prepare three baking sheets with parchment paper or baking mats. Using a stand mixer, beat butter and 1½ cups sugar on medium-high speed until light and fluffy, about 3 minutes. Beat in eggs one at a time on medium speed until completely mixed in. Make sure to scrape down the edges of the bowl as needed. In a large bowl whisk together flour, cream of tartar, baking soda and salt. On low speed, slowly add the flour mixture to the sugar mixture and beat until just combined and no flour streaks remain. In a small bowl whisk together ¼ cup sugar and pumpkin pie spices. Working with 3 tablespoons of dough at a time, roll into balls and then roll around in sugar mixture until coated. Evenly space 8 cookies per baking sheet leaving about 2 inches of space between each one. Bake cookies one sheet at a time for 8-12 minutes, until the edges have begun to set and brown, and the center is cracked but still soft and puffy. Err on the side of underbaking if you are unsure. Let the cookies cool on the sheet for 5-10 minutes and then transfer to a wire rack.